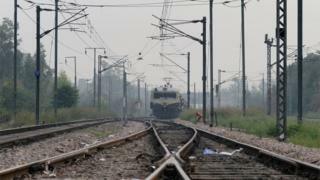 A teenager has died in the southern Indian city of Chennai while taking a selfie on railway tracks. He walked onto a railway track to get closer to an oncoming passenger train to take his picture on Sunday. But he couldn't move away in time and the train ran over him in Chennai (Madras), local police officials said. Last week an Austrian tourist was rescued from a well in Junagadh in western India after she fell into it while taking a selfie. "It was a freak accident. More youngsters are now addicted to taking selfies," railway police officer S Ramuthai told the AFP news agency. The 16-year-old was returning home after spending the day with friends when he decided to take a picture of himself in front of the train in Chennai, reports said. The number of deaths related with selfies has increased in the past year, prompting the police in Mumbai to declare "no-selfie zones" last month. The places include the iconic sea-facing Marine Drive promenade and the popular Girgaum Chowpatty beach, both major tourist attractions. The decision was taken after an 18-year-old girl drowned in the sea while taking a selfie in early January. Last year, authorities had imposed a "no selfie zone" at a Hindu festival in Mumbai due to fears they could cause stampedes.